Vinyl is a performance floor: it can take on scratches and spills and stains and spills and more. But for all its brawn, there is a stylish side to vinyl flooring today that leaves you plenty of design options to go along with that great performance. While Luxury Vinyl has caught everyone’s attention, good old-fashioned sheet vinyl is not so old fashioned anymore. Stylish looks abound and at price points you’re sure to love. Sheet vinyl flooring is offered in a range of qualities from base grade to luxury floors. The entire offering has benefitted from enhanced visuals and improved performance features even at the lower grades (although I always recommend you buy the best you can afford depending on the needs of the space). Sheet vinyl is often a printed product, which means that the design and color elements are literally printed right onto the vinyl. This is often referred to as rotovinyl because the printing drums roll on to the face of the product (a rotogravure process). After printing, a backing and a wear layer are applied. Sheet vinyl comes with felt backing, vinyl backing and modified backings systems which include fiberglass. Fiberglass backed floors have greater dimensional stability than other sheet vinyls. Sheet vinyl also comes as an inlaid product, meaning that the vinyl particles appear throughout the body and often contribute to the design and pattern for a richer finish. Color is an integral part of the floor since it is built right in, which minimizes any minor damage that might occur. These floors tend to be thicker than printed sheet vinyl and generally offer superior performance. Most sheet vinyl products should be either fully adhered to the subfloor or what they call perimeter adhere which is when only the outside edges of the floor are glued down. Vinyl tiles are usually 12-inch square tiles made of PVC combined with calcium carbonate (for rigidity) that can be adhered to the subfloor. Some VCT is available with stick-and-peel backing for easier installation. 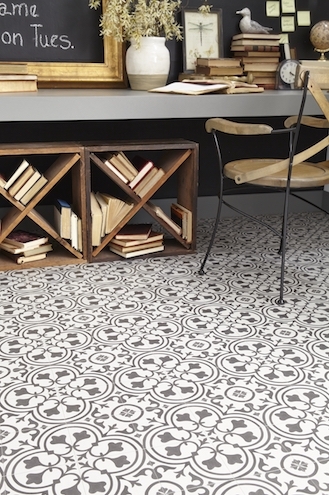 Vinyl tile is a good choice for do-it-yourself projects. However, it is generally recommended for commercial applications. In residential settings, you probably only want to use VCT for garages, basements and maybe laundry rooms. All vinyl flooring is made primarily of polyvinyl chloride (PVC).